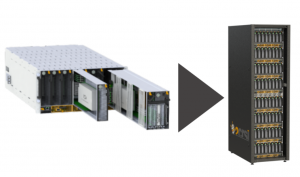 The openblade is designed to follow the lifecycle of your IT infrastructure. OpenBlade is highly scalable. One rack contains up to 16 blades but you can begin by using only 2 blades and add the other blades afterwards, when you need them. Then we have a 44U bay where we can add up to 8 OpenBlade. 2CRSI’s OpenBlade is the perfect scalable solution for your datacenter or your Big Data environment.